Hjertegarn is one of the pioneers of the yarn industry in Denmark. The company, which is family owned, was founded in 1926 and live by the philosophy that yarn should be cheap, so everyone can participate. They say that “Knitting is a hobby and a means to find peace and time for reflection in a stressed everyday life. Everything you need is a pair of knitting needles, a pattern and a yarn skein”. And here at Hobbii, we could not agree more. So even though you can buy a lot of pretty things premade, it gives a sense of calm and satisfaction to know that you can make it on your own, and to know that it looks exactly like something you have bought in a store, but only at half the price. Hjertegarn does not have their own factories, but they cooperate with loyal yarn manufacturers in both Asia and Europe. 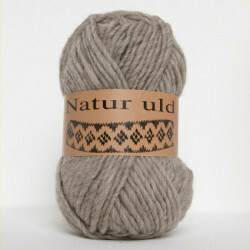 Here at Hobbii, we sell three different kinds of Hjertegarn: Lima Wool of 100% wool, Natur Wool of 100% wool and Arezzo Linen which is a mix of linen, cotton and bamboo. 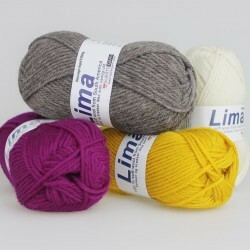 Lima Wool Hjertegarn is incredibly popular since it does not scratch the skin, which many other wool products have a tendency to do, so this yarn is also ideal for crocheted or knitted clothing for both kids and adults. 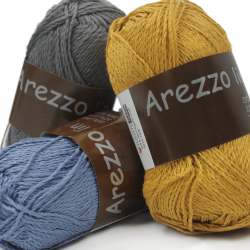 Arezzo Linen is also a lovely yarn, mainly because a third of the yarn consists of bamboo which makes the yarn easy to work with and provides you with an incredibly soft result. Both Arezzo Linen and Lima Wool are available in many different colors here at Hobbii. Thus, you have good chances of finding a Hjertegarn in the exact color you like. When you work with Hjertegarn, you have a lot of opportunities, it is basically only your imagination that limits you. So whether you prefer a classic, trendy style, a bohemian style or a romantic style, you can without a doubt find the right one from Hjertegarn. Here at our site, you can also find various free crochet and knitting patterns, if you need a bit of inspiration, or you can invest in one of our catalogues or books which also contain a lot of inspiration. Here at Hobbii, we strive to be some of the best and the fastest at delivering Hjertegarn yarn and yarn supplies. Thus, you always receive your goods no later than 3 weekdays after you placed your order online. We take great pride in having a high standard customer service and you can always call us, if you have any questions regarding some of our products. We always provide you with a full refund on goods ordered via our online shop. You are always welcome to contact us, if you have any questions regarding our Hjertegarn yarn, or if you need help with ordering. You can contact us via our contact form, and we will answer you as quickly as possible. We are looking forward to welcoming you as a customer.